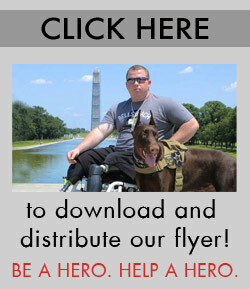 Besides a monetary donation, there are other ways you can help Argus assist disabled veterans. Be a part of the mission. Click on image below to download and print out our flyer and openly display or distribute in business’s and public places. We welcome the sponsorship of business’s and other organizations that may share the spirit of our mission. Those who donate the cost of providing a dog, (or higher), will be featured on our site and be able to advertise the fact that they are active supporters of the Argus Service Dog Organization. 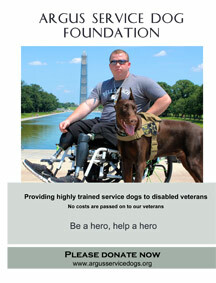 Please contact us for further information at argusservicedogs@gmail.com.